Size XS S M Please select a size before adding to the basket. The Empreinte Ashley Shorty in jardin d’ete is as flattering as it is beautiful. 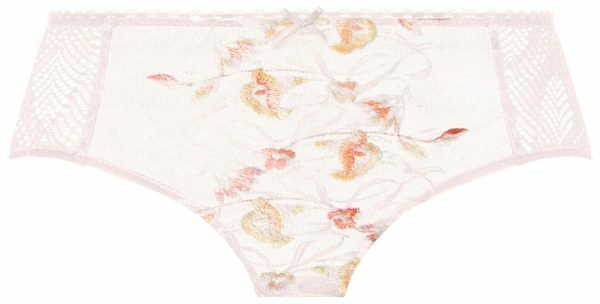 Boasting a stunning peach colourway, we’re certain you’ll love this brief as much as we do. Empreinte lingerie is all about the intricate detailing and the Ashley shorty in no exception! The stunning combination of floral embroidery and beautiful transparency gives a contemporary look. We also love the seamless sheer mesh fabric as it gives a smooth finish under fitted clothing and no VPL. Team the Empreinte Ashley Shorty with the matching balconette bra for a sultry two-piece. Please note, Empreinte sizing comes up generous so we denote XS to be a size 10, Small as a 12 and so on.